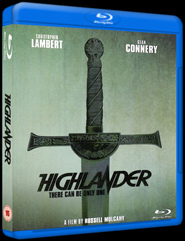 During a fierce sword battle in the 1500s, Connor MacLeod, a simple Scotsman known as a poor fighter, is mortally wounded -- but he does not die. MacLeod learns from the mysterious Ramírez that he is of a race of immortals. These rare knights never age and never reproduce, they can only meet death by the blade of another of their kind. Leaping back and forth through the centuries, MacLeod once again meets the evil Kurgan who nearly killed him 500 years ago. There can be only one.